By Aimee McCarthy | October 1, 2012. Sunday’s Ryder Cup ending depicted scenes of great emotion on the faces of Europe’s dozen champions. Olazábal gave a touching interview, moments after Europe’s immense victory on US turf, and had to pull his cap over his head to hide the imminent tears circulating in the Spaniard’s eyes. Nothing could have honoured Seve Ballesteros’ memory more, than the fighting spirit oozing from the European team on Sunday. 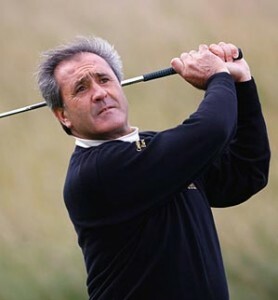 Ballesteros passed away last May as a result of a brain tumour. The team captain, Olazábal, had given an inspirational speech in Europe’s team room on Saturday night, after McIllroy and Poulter finished the day on a high note, although the Europeans were still trailing the Americans by 10-6. The Europeans stepped out onto the course on Sunday with a look of sheer determination in their eyes, which was illustrated in their successive victories over their US counterparts throughout the day. A euphoric comeback was cemented at the end of the day when Tiger Woods conceded Francesco Molinari’s 4 foot putt on the 18th green. The US fans arrived in their thousands expecting a raucous celebration, but the over confident Americans were outclassed on the final day by Europe in what will surely be remembered as one of the greatest Ryder Cup tournaments in history.